BIG 127 Piece Set! 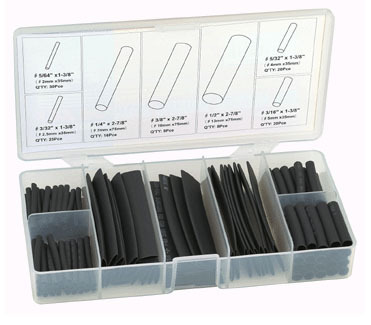 This handy shrink tubing kit includes seven different sizes of tubing from 5/64 inch to 1/2 inch, in handy pre-cut sizes. Easy to use for proper, good-looking wiring repairs. Slip a piece of tubing over one wire, make your connection, slide the tubing in place, and use heat from a match, lighter, or heat gun, to shrink the tubing over the repaired connection. Makes neat-looking repairs and properly insulates wiring for protection. Great for all kinds of pinball repairs! Includes compact storage case that measures 7 inches by 3-1/2 inches and fits neatly into any toolbox.